One of the best - picturesque places in Bulgaria is Emen Canyon. Located in the foothills of the region, along the river Negovanka, 20 kilometers west of the town of Veliko Tarnovo. Flowing water is formed from soft limestone bizarre and beautiful forms, waterfalls, thresholds, niches and pools overlooked by 90-meter cliffs. Emen Canyon starts with. Novo Selo and extension valley, where the village of Emmen, divides the canyon of the Lower and Upper Boaz. The area is the first in Bulgaria trail, named for the river - Negovanka. The entire trail are built wooden structures to make your ride easy and enjoyable - bridges, stairs and railings. The most beautiful part of the trail is Momin Skok waterfall. Its height is 10 meters on three sides surrounded by high cliffs. Under the waterfall was formed wide pool. Its name comes from a legend that tells of three girls, jumped off the cliff together in a pool to escape persecution them Ottomans. Here is one of the most - rainbows caves in Bulgaria - Emenska cave. Over 3 km long cave here every year attracts many cavers and tourists. Studies crawling over her that was inhabited as early as the Neolithic Age, were discovered artifacts from the Bronze and Iron Ages, and from ancient times. During communism was used as a mushroom farm, then was converted to a dairy maturing, she was part of the military establishment. 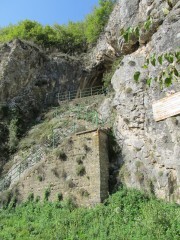 Emenska cave is the only one which has placed lift. Besides this, the area has another twelve caves. Most - right time of year to visit is spring Emen canyon. Then the river is - deep, most air - fresh and most forest - beautiful. End Negovanca ekopatka has many green meadows suitable for picnic with family or friends. Virat the waterfall can be used as a beach. Opportunities for active recreation there are many. The starting point of the trail is Emenska the village. There is also a possibility of accommodation.